STR/AP/Press Association Images. All rights reserved.After crushing Friday’s coup – with the death toll rising close to 300 – the Turkish government has now started its greatest purge campaign so far: cleansing the military and civilian bureaucracy of thousands of opponents. The situation is full of ironies. The Gülenists (the world leaders of a modernist, tolerant Islam, according to some) are accused by president Recep Tayyip Erdoğan of staging the major coup attempt against a regime once celebrated as the model of Islamic democracy. But most importantly, this antidemocratic attempt against an antidemocratic regime is most likely to push it in the worst possible direction. The Turkish regime has, for a while now, been shyly experimenting with mobilising the masses to repress its enemies. It can now shed its coyness. It is impossible to get all the relevant facts at this point, but Erdoğan has accused Gülen followers in the military of starting the coup, counting on support from other soldiers and civilians. However, even some military personnel known for their pro-coup tendencies, as well as the three opposition parties in parliament, criticised the attempt in a matter of a few hours. And it seems that the number of Kemalist soldiers who declined to join the coup outweighs those who participated by a great margin. On realising just how isolated they were, some soldiers started to surrender. In utter desperation, some others committed heinous acts which no other (failed or successful) Turkish junta has ever contemplated, including bombing the parliament. The fragility and near insanity of the coup bloc appears to have resulted from panic: Ahmet Şık, a top Gülen expert and investigative journalist, argues that the government had scheduled major operations for 16 July, when hundreds of Gülen supporters in the military were to be arrested. Did the Gülenists learn of the plan too late to build major alliances and concoct a more systematic coup? Still, the coup attempt was so poorly executed and so little interested in elite or popular support that various conspiracy theories cannot be entirely ruled out (many Kemalist military sympathisers believe that the government itself organised the coup to create an excuse for wholesale repression). Such details about the exact mechanics of the coup can be nothing but speculation for now, especially because all sides are heavily invested in finger-pointing. But what are the most likely outcomes of the failed coup? The link between Gülenists and the failed coup does not come as a surprise for anyone who has followed the Gülen community closely and resisted the global hype about its democratic credentials. The founder of the movement, preacher Fethullah Gülen, had wholeheartedly supported the bloodiest junta in Turkish history (September 1980 – 1983) and had also welcomed the civilian government created by another military intervention (February 1997). There are more reasons to be suspicious of Gülen: it is believed that his followers have systematically but surreptitiously infiltrated major official institutions. Moreover, after Erdoğan emptied the military of Kemalist soldiers as far as he could, the regime played into Gülen’s hands by staffing it further with his followers. Academics, journalists, diplomats, and politicians have ignored Gülen’s statism for decades, choosing instead to market him as the most civilian face of Islam in Turkey. Others have gone even further in presenting him as the greatest reformer in Islamic history: a Muslim version of Martin Luther. It had already become harder to believe in this hero after he split with the Turkish regime in a quite unpleasant way, with Gülen followers exposing themselves as power-grabbers rather than principled democrats. Even if Gülen is not directly involved in 2016’s coup attempt, his image is now so tarnished that no one will seriously call him a Martin Luther any more. Dreams of an Islamic Reformation have, once again, crumbled. The Turkish regime has been swinging dangerously between an extreme version of right-wing Bonopartism and (what I have recently called) neo-fascism over the last few years. Bonopartism is a top-down dictatorship that only occasionally deploys mass action. Bonopartist masses are disorganised and do not have a coherent ideology. Fascist regimes, by contrast, depend on the masses more organically. Their masses are organised and are more ideologically in tune with the regime. Compared with the classical fascist regimes, inter-war Italy and Germany, the Turkish regime had a much more troubled relation with its (Islamist) civic roots (the Erdoğan government publicly disowned Islamism in its first few years). Yet the new regime gradually re-incorporated and re-mobilised the masses and civic circles it had previously demobilised. In the last couple of months, the Turkish regime had been shifting once again in a Bonapartist direction, de-emphasising mass mobilisation. It was also incorporating elements of the third entrenched form of modern authoritarianism (military dictatorship): especially after the pro-Kurdish HDP’s election victory in June 2015, Erdoğan started to relentlessly utilise the military against opponents. But now, given the pro-regime numbers on the streets (and soldiers once again declared an enemy of the nation), the fascistic actors within the regime have the opportunity to sustain mass mobilisation and take the country in a more totalitarian direction. As of yet, they have not squandered this chance. After president Erdoğan’s invitation to people to flood into the streets, and face down the military rebels, mosques across the country also urged citizens to thwart the coup. 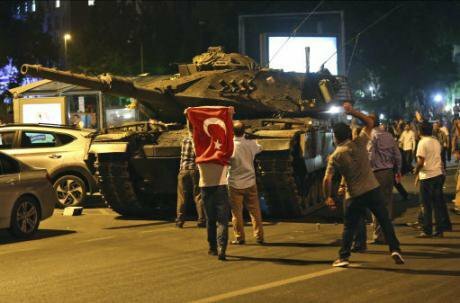 In city centres, provincial towns, and inner cities, people climbed onto tanks clutching Turkish flags. The captured photography and video are likely to become as iconic as images of tank-blocking Chinese students in Tiananmen Square. But these masses have done much, much more. They have attacked the pro-Kurdish party HDP (which has nothing to do with the coup attempt) in several towns. They have harassed alcohol consumers. Several clashes have broken out in Alevi (a religious minority) neighbourhoods and towns. This is the dark side of what has been celebrated by some as the democratic defence of the regime by the people. This new ‘anti-militarist’ mass mobilisation in Turkey has been building up (as counter-revolt) ever since the anti-government Gezi protests in 2013, targeting minorities, alcohol consumers, and all kinds of opposition, as much as military personnel. In October 2015, close to 100 pro-Kurdish activists in Ankara were massacred in an ISIS-linked bombing. Witnesses saw police deploying tear-gas against survivors, and blocking ambulances trying to reach the injured. That tragedy is now coupled with mass action against the dead: during the recent anti-coup celebrations, ‘pro-democracy’ masses destroyed a monument to the Ankara victims. There is no question about where the sympathy of these masses lie. Most of the pessimistic predictions about the aftermath of the failed coup have focused on how it will fulfil Erdoğan’s desire for an omnipotent presidency. The danger that awaits Turkey is much greater than that.